To date well over two hundred (lost count) have ordered new after trying second hand, and 144 Owners have ordered a SECOND new Bushtracker..
That kind of return business is our measure of success.. Bushtracker has many that copy us in style, but really none that compare with our level of quality and Service. Great words of wisdom sir. Also the owners who listened to your advice about the building of their Bushtracker and choice of tow vehicle. Some of these owners have kept, used, lived in & loved their BT's for ten to fifteen years or more. Many of these owners have returned to the factory and spent many thousands of dollars upgrading to the latest technology and features. In a throw away society this shows what a "life decision" the purchase of a Bushtracker can be. After driving out of a car wash in Wangaratta the other day a lady said to me: "What a beautiful caravan. Is it NEW!!!" Need I say more. We picked up our new 19' Bushtracker on Tuesday. It's now loaded up and we're on our shake-down trip. It looks great and tows great. The level of detail provided by Stacey during our familiarisation was fantastic. She listens to her customers and gave us a great level of confidence. When we pointed out a few minor issues she was quick to organise the boys to get them rectified. Thanks Stacey. We are also impressed with the obvious quality control employed during the build, and even while our existing WDH was being modified. Old bolts in the WDH were replaced, nuts and threads marked, and the overall care and accuracy of the set-up was professionally executed. The van wasn't quite finished when we arrived, so there were numerous workers coming in and out finalising bits and pieces whilst we were going though the handover. All of the workers we encountered were polite, pleasant and often humorous. Everyone contributed to an experience that instilled confidence in the brand. You've got a good team there Steve! 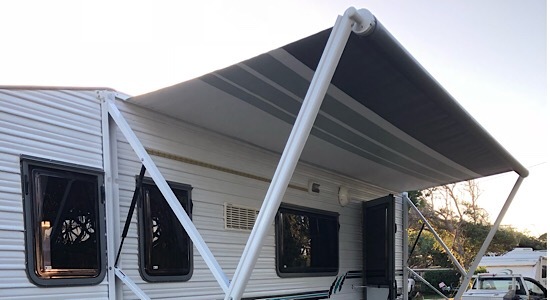 Having received our caravan back safe and sound and looking fantastic following expansive repairs, a service and a new motorised awning, I can only say many thanks to the crew at Bushtracker. Ryan is unflappable, professional, cares passionatley about the Bushtracker product, and above all, cares about his customer. Ryan and the team are exceptional assets to the Bushtracker brand and without doubt, will continue to deliver the best assistance to all Bushtracker owners. Merry Christmas and a happy New year to all. As I write this I am sitting in a Qantas aircraft high above the Indian Ocean en route to Johannesburg South Africa. Our adventure started early in 2017 when my wife and I decided to return to the caravanning way of travel after last having owned a caravan eighteen years ago. We wish to travel the vast back country roads of Southern Africa. After discovering that there is no Off Road caravan manufactured in South Africa which could meet our needs of being as luxurious and spacious as the grandest on road caravan we realized that we would have to look further afield. Neither the Americas nor Europe yielded much to look at so we widened our search to Australia. I never imagined the vastness of the Australian caravan Industry. It took me a few months to work through all of the off road caravan manufacturers and by mid-year I had I had narrowed our search down to two manufacturers. It was now time for a visit to the manufacturers to have an in depth look. After visiting the two factories the decision to purchase a Bushtracker was an easy one to make; it is clearly there to be seen. Delivery was scheduled for mid-January and on our arrival at the factory we were thrilled to see our new 22’ caravan standing on the launch pad waiting for us. We spent an intense day of orientation with Stacy learning how to use the various systems and then it was time to roll out of the factory and head off on a two week road trip to try out all the systems and to clock up the recommended 1000 km’s before returning to the factory for the first service. We spent an awesome two weeks travelling during which time we got to know most of the onboard systems. We also met up with two other very satisfied Bushtracker owners in the Cania Gorge area. Our initial contact was with Andrew Liddel who did a magnificent job in quickly helping us to streamline our search to exactly what we were looking for. I had many telephone discussions with Matthew Kurvink before our initial visit and then we were handed over to Philip Wilson to complete the design and specifications. Josh Gibbs was a great help in assisting with the international payments etc. The team at Bushtracker were amazing, nothing was ever too much trouble and they always went the extra mile for us, it was an absolute pleasure dealing with Matthew and his team. My impression is that although Bushtracker is one of many Australian caravan manufacturers they are most certainly at the top of the game in their sector of luxury TRUE off road caravans. Our adventure continues as we now have to ship the caravan from Brisbane to South Africa. Picked up our 20’ van in July 17. Departed on our circumnavigation on Jan 18, currently in Maryborough QLD heading up to begin the Savannah way over the next few months. During the sea trials prior to Jan we had our fair share of issues, cooker, fridge, washing machine, en-suite door, all failed, together with some other bits and pieces. Oh, and the awning that I damaged in a moment of forgetfulness. Anyhows, annoying as these were, the spirit under which the fixes were undertaken, together with the thoroughness and quality of the BTi work, went a long way to easing the pain, and I would like to thank Stuey and his team for their contributions to that. As somebody else said, issues are to be expected and its how they are dealt with that matters. Ok, off to Maryborough market now. We have recently sold our Bushtracker after 8 years of travelling. Could you please cancel our forum membership. (Mr & Mrs Bean). Please pass on our sincere thanks to the staff we have dealt with. They have provided excellent service whether in sales, servicing or repairs. We are moving on the the next stage of our lives (which is non caravan related) and will continue to espouse the virtues of Bushtracker at every opportunity. Well here I go again. Thank you to Bushtracker, Steve & staff for the brilliant service I received when I visited the Factory on June 21 & 22. My van was in for service, a new electric awning & a solar panel upgrade. Special thanks to Stuart, Zak, Gordon, Tony & and anyone else who worked on the van. The quality of the work was exceptional. I really did feel that I received VIP treatment. My pride & pleasure in owning a Bushtracker only gets stronger as the years go by. Sixteen years this September.